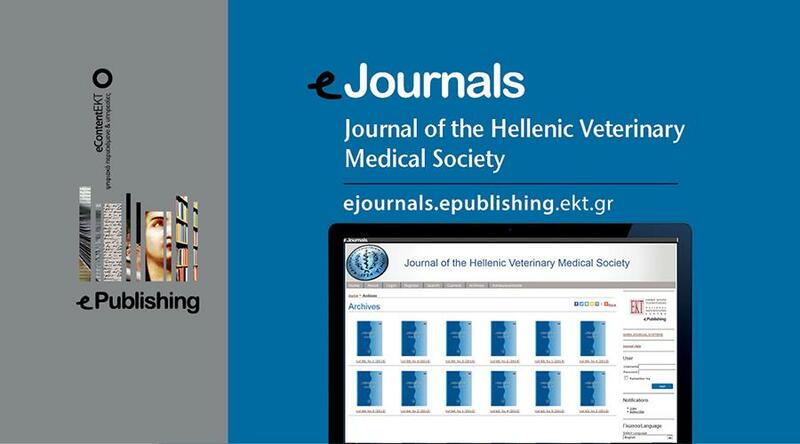 The quarterly peer-reviewed journal published by the Hellenic Veterinary Medical Society includes articles on all aspects of veterinary science and related disciplines and is indexed in the Web of Science and Scopus. The National Documentation Centre (EKT) has launched another new publishing collaboration, this time with the Hellenic Veterinary Medical Society (HVMS), to publish the Journal of the Hellenic Veterinary Medical Society online. From now on, the journal will be available online with Open Access via EKT’s ePublishing service eJournals. The journal, which is indexed in the Web of Science and Scopus, is published four times per year and publishes peer-reviewed research relating to Clinical Science of Companion Animals, Productive Livestock and Laboratory Animals, Welfare and Bioethics and Hygiene and Safety for Foods of Animal Origin. IgY extraction and purification from chicken egg yolk (G BIZANOV). The Effect of Omega 3 and Vitamin E against Avian Influenza in Broiler Chickens (M. TASEER, A. ASLAM, Z. I. CHAUDHARY, K. ASHRAF, R. AKHTAR, G. MUSTAFA). The Hellenic Veterinary Medical Society (HVMS) is a scientific society which aims to promote and safeguard veterinary science through the improvement of and increase in livestock production, protection of the health of animals, the hygiene, technology and safety for foods of animal origin, public health and environment, promotion of veterinary research, experimental medicine, protection of animals, biomedicine and biotechnology, artificial insemination, transplantation of embryos and scientific ethics. HVMS is one of the oldest Scientific Associations in the country. It was founded in 1924 and its first journal was published in 1926. In addition to publishing its journal, it organises, among other things, symposia, workshops, lectures and is almost exclusively responsible for the life-long education of Greek vets and students of the Veterinary School. HVMS also works with Higher Education Institutes, Technological Educational Institutes, Veterinary Services, Veterinary Associations as well as Scientific Societies and Chambers in Greece and abroad. The society has 926 members, many of whom excel in the science (university professors, researchers), administration, the military and professional veterinary societies and chambers in Greece and abroad. EKT ePublishing (http://epublishing.ekt.gr/) comprises three platforms, for the publication of journals (http://ejournals.epublishing.ekt.gr), conference proceedings (http://eproceedings.epublishing.ekt.gr) and book-monographs (http://ebooks.epublishing.ekt.gr). These platforms host the content of each publisher (journals, monographs, conference proceedings) and enables the coexistence with other reputable publishers. eJournals, as an individual platform of EKT’s ePublishing, hosts high quality open access scientific journals, 32 to date, and offers a single access point to reputable content, strengthening academic communication and research activity. Today, many reputable organisations use EKT’s electronic publishing platform for their transition to modern scientific publications in all stages of the process. Under their agreement, EKT provides the infrastructure for the online publication of the journal, while HVMS provides the peer-reviewed content.